Microsoft is now testing Windows 10 build 15041 for PC and mobile build 10.0.15041.1000. 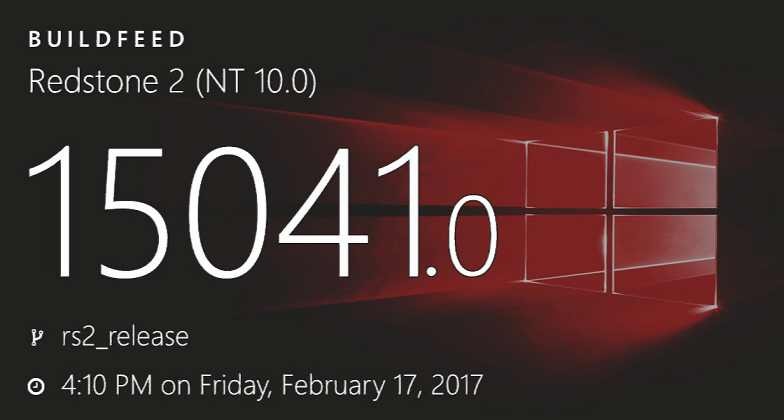 The new Windows 10 Creators Update Insider build 15041.0 was compiled on February 17, 2017. Previously, Windows Insider team released Windows 10 PC build 15031 and mobile build 10.0.15031 for Fast Ring members. However, few Insider members are reporting ‘download stuck at 0%’ and other issues with the build. Read here for fixes for build 15031. Microsoft is expected to release Windows 10 Creators Update in April. The next major updates Redstone 3 and Redstone 4 will come later this year and next year respectively. Windows 10 build 15025 ISO images are now available for download. You can download ISO from here. Windows Insider team may release Windows 10 build 15041 for PC and mobile Fast ring members this week.